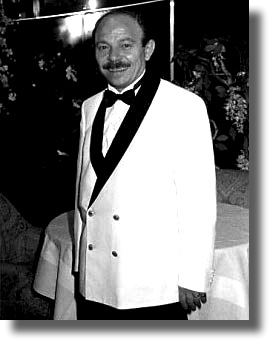 Restaurant's Best Austin voted Eddie Martinez McElroy the city champion maitre d' three years running, 1976 to 1979 and again in 1981. Before the days of “customer experience,” Eddie figured out whatever information he could about his clients. He asked them for business cards, recorded their phone numbers from the reservation book, snapped photos of them in his mind, attaching names, wives' names, and peculiarities of taste. Then at the bar, night after night, when the boss, Johnny, had bolted the doors and the place had gone quiet, and with the first of many vodka shots before him, Eddie recorded when a customer'd visited, what the customer'd ordered, what wine he or she had drunk, and whether or not a couple were celebrating a christening or birthday or anniversary. He'd move that information to a card catalog and a calendar. He knew when Hallmark was about to change inventory and bought stacks of greeting cards sorted by category: thank you, birthday, anniversary, wedding. After your visit, he'd send you a Thank You, then, well in advance of that next birthday or christening or anniversary, a congratulatory card and invitation to visit him at Johnny's Prime and Seafood Grotto. He was short and thin with wiry reddish hair, full lips, a pencil thin moustache, and a small hawked nose. He'd come to Jesus as a boy back home, in Leveland, Texas and never missed church. His Born Again Mexican mother had taught him simple but impeccable manners, and from his father, an Orangeman of Cavan, he'd an odd accent and beautiful formal syntax, a way with words. Eddie was a Texas gentleman. When Eddie manned its Maître d's podium, grace and warmth beamed from Johnny's. Mr. Bohannan, he might suggest, I believe you prefer the Bordeaux St Emillion with your tri tip, and indeed I've a bottle breathing for you, but certainly you'll enjoy one of our Chateau Montclaire Medoc which I've also prepared. I beg you indicate your pleasure. Of course, the Medoc ran only two or three dollars more than the St Emillion, but Eddie would up sell next year again and the year after as he led his customer skyward on the fine wine ladder. Moreover, he always offered “something special” from the kitchen, and indeed Chef, well-rewarded for his efforts and anxious to exercise his chops, always accommodated Eddie's customers. Obsessive compulsive, as you can imagine, Eddie constantly crammed napkins into his pockets so as to never need touch a doorknob, and even when dining at Johnny's always carried his own knife, fork, and spoon which he could be sure were perfectly clean; he'd worked in restaurants too long to do otherwise, he claimed, although he never worried about vodka glasses. When Eddie showed up with a bruised cheek or dark eye or slinged wrist, Johnny's staff knew someone would need drive him home very late, and that the vodka wouldn't end at Johnny's and that very likely, Johnny himself should take over maître d' duties the next night or two. On the bright side, Eddie'd be rid of whoever she was and six or eight months of uninterrupted duty would ensue. Eddie earned $91,000 in 1978, but his customers well being meant more than those substantial tips. Eventually, however, all that care's burden, all that meticulous attention wore him away, and his bad habits overtook him. He pissed away everything, his money and his health, on drink... John Barleycorn he said, and low companions... barflies and needy, violent women in one poisonous relationship after another. After an episode in 1982, Eddie disappeared, simply didn't return to work. Some said he'd committed himself to Kerrville to dry out; others claimed he'd set out for the big time in Los Angeles. The staff hung his picture behind the maître d's podium. Customers complained of his absence; Johnny tried new maître d's, but none measured up to Eddie. He finally settled on a succession of tight skirted, long legged hostesses who studied hospitality at UT. Someone found Eddie by chance a few years later, and news got back to Johnny's. He was cooking avocado soups and tossing goat cheese and vinaigrette salads back home in Leveland. His drinking had subsided a bit... was no longer aggravated by stress and wrong women. His 90 year old mother was his best and only customer. He himself claimed to be fair to middling, but he hoped the Lord's light shined upon his old clients' faces. Amazing capture, Steve. I am so impressed. Must say I was looking for the 'why' to the piece as I read, looking for clues as to how it was going to 'turn,' (will it be funny? sad? dramatic?) and then it was over and I realized it was a fine n' fitting tribute to an interesting guy. "When Eddie manned its Maître d's podium, grace and warmth beamed from Johnny's. Mr. Bohannan, he might suggest, I believe you prefer the Bordeaux St Emillion with your tri tip, and indeed I've a bottle breathing for you, but certainly you'll enjoy one of our Chateau Montclaire Medoc which I've also prepared. I beg you indicate your pleasure"
This is a tragic, somehow larger than life story, and I enjoyed it very much! Fave, How did I miss this. A terrific story, so well told. Bonus points for knowing about the Alcohol Rehab center in Kerrville. sick, in the best way "Obsessive compulsive, as you can imagine, Eddie constantly crammed napkins into his pockets so as to never need touch a doorknob."